In the past decades, rapid technological advancements and innovations have imposed a complete change in the atmosphere focusing on the betterment of where we live in. Such advancements, on the flip side, has greatly depleted the environment leading to health related issues, climate change, ozone depletion, changes in ecosystems, loss of fauna and flora, depletion of biodiversity and land degradation. However, many awareness drives are taken worldwide to raise initiatives on environmental issues and demonstrate support for environmental protection to bring down its severity and occurrence rate. 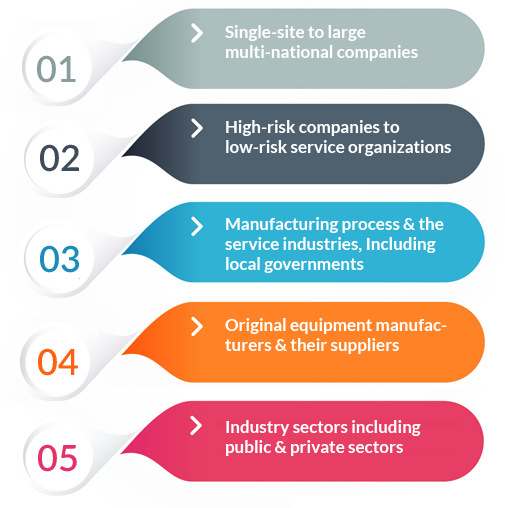 Nowadays, production/processing/service providers are under constraint to make supply chains more environmentally friendly due to the growing global demand of the environmental impact of consumer lifestyles.Various tools and techniques have been used to tackle environmental degradation, but one of the most successful approaches has been through the use of ISO 14001, the Environmental Management System (EMS). 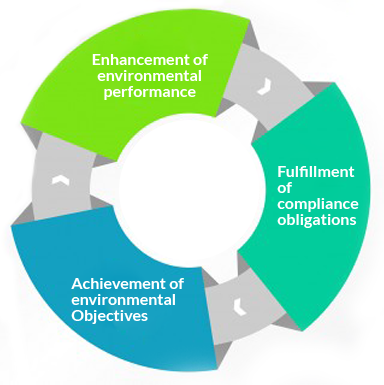 It is a voluntary standard that assists organizations to establish, implement, maintain and improve their Environmental Management System through a framework that helps a company achieve its environmental goals through consistent control of its operations. The EMS thus helps an organization to address its regulatory demands in a systematic, cost-effective proactive approach that address non-regulated issues, such as energy conservation, and can promote stronger operational control and employee stewardship. 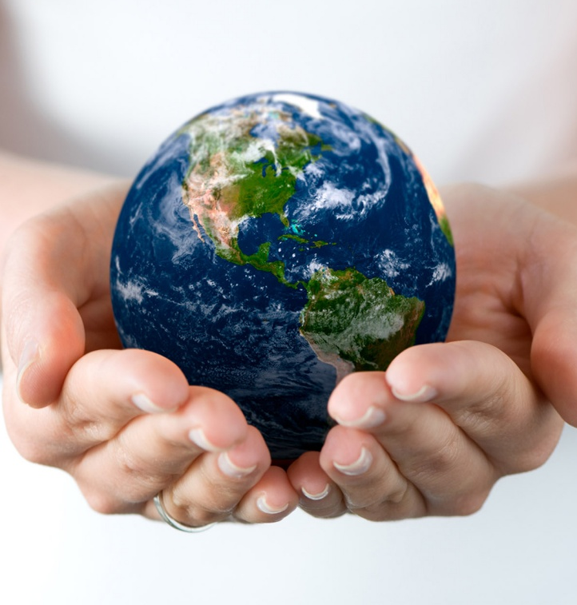 Who should use ISO 14001? What is ISO 14001 based on? Several factors including the organization’s industry, environmental policy, products and service offerings, and locationapplies to the environmental aspects of its activities, products and services that the organization determines that it can either control or influence considering a life cycle perspective.Certification to ISO 14001 will provide assurance that an organization’s environmental management system is operating efficiently and effectively. As ISO 14001's commitment to continual improvement of the EMS, the setting of improvement objectives will help the drive for more efficient use of raw materials, so helping reduce costs. It helps us to achieve improved efficiencies and reduced costs reducing the risks associated with any costs or damage to your reputation associated with cleanups or litigation and builds your public image towards clients, regulatory bodies and key stakeholders. The systems also look into the needs of your human resource which will also increase staff morale, competencies in environmental aspects and commitment. It increases leadership involvement and engagement of our employees thereby, your management system can integrate the requirements of this and other management standards into a single business system so reducing duplication and costs. Above all, complying to standards provide you with the accolades for competitive edge. The essential elements for ISO 14001 environmental management systems certification, are that it must commit to continual improvement and to comply with applicable regulations and legislation, the elements which will drive your organization to continually develop your environmental performance and achieve greater recognition in the marketplace in which you operate. 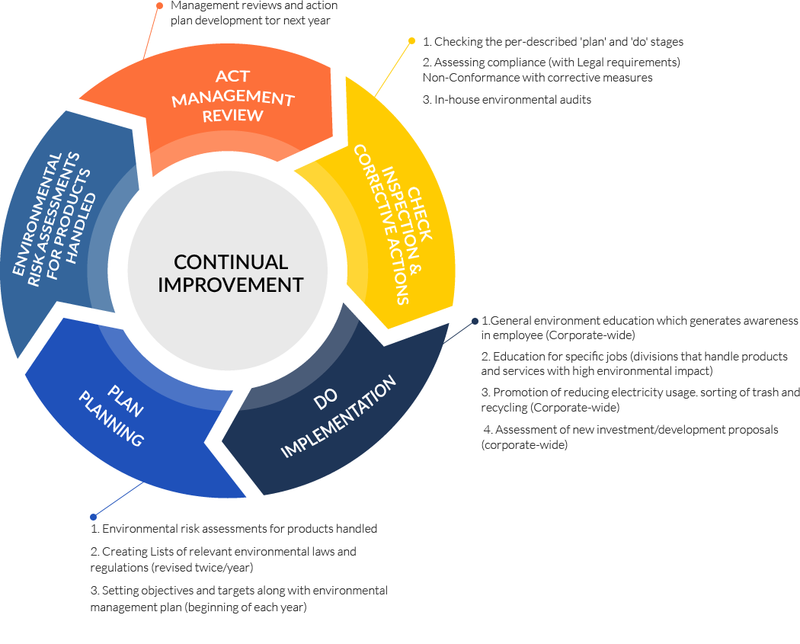 To support such a task, the ISO 14001 management system is based highlighted by the ‘Plan Do Check Act’ cycle in common with other management system standards thus enabling seamless integration with ISO 9001 (Quality), OHSAS 18001 (Health & Safety) and other management systems based standards. In order to effectively identify the elements of current and future operations which does interact with the term “Environmental Aspects”, an initial gap assessment is always a recommended factor. Such factor greatly helps the organization to plan on management controls and procedures in order to establish their environmental goals and targets which can then be built into their policy. In this phase, the organization identifies the resources to foster better commitment and control over the elements such as documentation control, emergency preparedness and response, and the education of employees, to ensure that they can competently implement the necessary processes and record results. However, communication and participation across all levels of the organization, especially top management, is the vital part of this implementation phase along with effective EMS in place. Once the process has been implemented, periodic monitoring of organization’s performance is implemented to ensure that the environmental targets and objectives are being met.In addition to that, internal audits are conducted at planned intervals to make sure that EMS meets the user’s expectations and whether the processes and procedures are being adequately maintained and monitored. During this stage, a management review is conducted to ensure that the objectives of the EMS are being met, the extent to which they are being met, and that communications are being appropriately managed; and to evaluate changing circumstances, such as legal requirements, in order to make recommendations for further improvement of the system. TRAIBCERT’s experienced and highly-skilled auditors would listen to you and perform an initial assessment of the environmental management system that is implemented. The audit focuses mainly on the areas of the system that needs further improvements inline with the ISO requirements, in order to achieve the goal of implementing the system. Once identifying and eradicating potential vulnerabilities in the management system, the actual audit in relation to the certification begins. This phase is comprised of a stage 1 and stage 2 audit consists of detailed review where, TRAIBCERT’s auditors with expertise and vast knowledge on the industry sectors,assess your documentation and practical application of your environmental management system to fulfill the certification requirements. We strive to reveal observations that can add value through reduced impact, increase commitment, and decrease treats. Once our highly competent & qualified auditors who are experts in the sector, identifies that your CMS satisfies the requirements of ISO 14001-2015, we TRAIBCERT a leading accredited certification body with expertise in environmental managment system will Issue the ISO 14001-2015 certificate. Annual surveillance of the ongoing optimization of your processes and environmental management system would be carried out to ensure adherence of the system with that of the ISO standards. 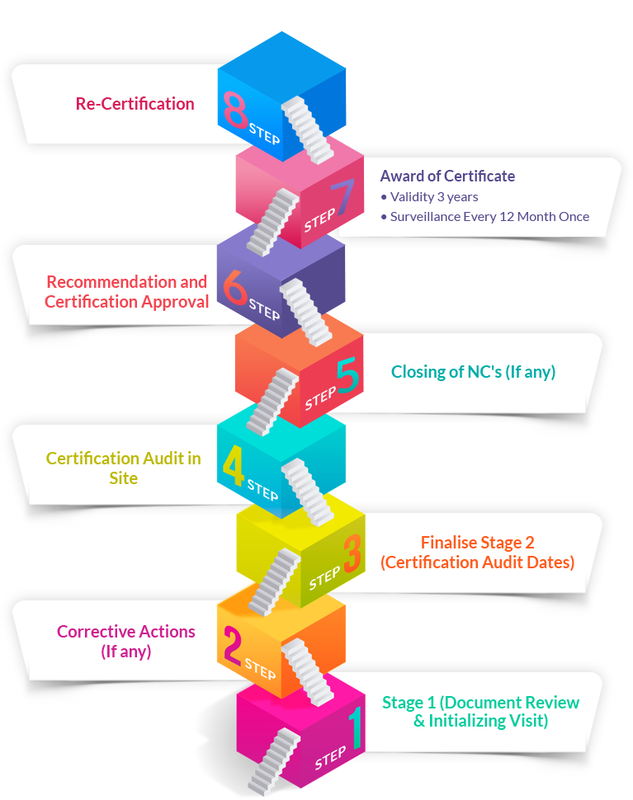 Upon reaching 3 years from the date of issuance of certificate, the maximum validity of the certificate, we will provide full support to your organization towards the re-certification for the net term. Whatever your line of business be, at TRAIBCERT are accredited to issue certificates to the ISO 14001 standard throughout all sector sharing the capability and knowledge in providing an effective service.Our unique methodology, in-depth understanding and the technical expertise of our assessors enables us to deliver tangible benefits to our clients through a structured project management approach and helps organizations manage their systems and risks to improve and protect their current and future performance. This ensures that ISO 14001 certification is conducted with the highest degree of professionalism and conformance to international guidelines and standards allowing your company to lean on our experience and know-how.TRAIBCERT is audited annually by our accreditation bodies to ensure its services meet the exact requirements of the relevant accreditation standards.